EVER SINCE JESUS CHRIST was arrested and tried before Pilate, imprisonment has been the experience of many who follow him. Seldom are Christians imprisoned only for religious beliefs. There are often ethnic, social, political, or cultural reasons. And some Christians, sadly, are imprisoned for actual crimes. Ancient Romans believed in gods who oversaw and protected various areas of life. Not showing respect and loyalty to these gods undermined the security of the state; when early Christians proclaimed one God as supreme, they were seen as disloyal and treasonous. Periodic persecutions brought many Christians to prison during the first few centuries of the church. Prison in those days was generally used to hold the accused before trial and the convicted until execution, not as a punishment in its own right. 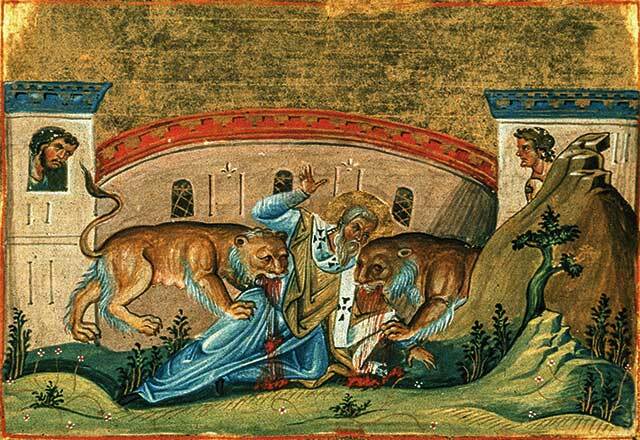 Justin (100–165) was first impressed by the faithfulness and steadfastness of Christian martyrs. Then an old Christian man walking on the seashore convinced him that Jesus was the fulfillment of the Hebrew prophets. Justin opened a school of Christian philosophy in Rome. Arrested for practicing an unauthorized religion, he refused to renounce Christianity and was beheaded along with some of his students. Origen (185–254) was also raised in the context of persecution. His father was martyred when Origen was just 17 years old. As a young man, he became the student of Clement of Alexandria (c. 150–c. 215) and was appointed the head of the Catechetical School of Alexandria. Forced from Alexandria he went to Caesarea and was caught up in persecution. Tortured and released he died of his injuries. Cyprian (c. 200–258), born to wealthy pagan parents, converted in his forties. Elected bishop of Carthage in 250, he soon went into hiding to escape Emperor Decius’s persecution, but could not escape Valerian’s persecution a few years later. After banishment and imprisonment, he was executed by the sword in an open place near the city of Carthage, becoming the first bishop-martyr of Africa. After Christianity became legal, Christians still ran afoul of their enemies and still committed crimes. Prisons generally served as holding places before execution, the payment of fines or taxes, or public humiliation. Sometimes, though, prisoners would be assigned only to serve time: in medieval England the most common long sentence was a year and a day. Good treatment was frequently based on whether or not prisoners could pay their jailers. Christians were encouraged to visit and give to prisoners as one of the seven corporal acts of mercy taught by the church in response to Isaiah 58:6–10. Prisons were often modeled on monasteries to encourage contemplation and penitence. In 1298 Pope Boniface VIII published a law stating that the purpose of prison was confinement, not punishment—not that everyone agreed. But just four days later, Joan was wearing men’s clothes again and claiming visions. She protested the jailers had not kept their end of the bargain: “I would rather die than be in irons! But if I am allowed to go to Mass, and am taken out of irons and put into a gracious prison … I will be good, and do as the Church wills … I would rather do penance once for all—that is die—than endure any longer the suffering of a prison.” The church burned her as a relapsed heretic on May 30. Twenty-five years later, her case was reversed on appeal. 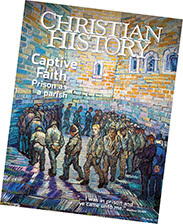 Order Christian History #123: Captive Faith: Prison as Parish in print. The Reformation divided Western Christians into competing factions all too ready to persecute one another, and many iconic prison stories date from this era. Martin Luther (1483–1546), ironically, was imprisoned for his own protection, not as punishment. Frederick III had him kidnapped and hidden in Wartburg Castle for 10 months. Luther grew a beard, took the name Junker Jörg, and set about writing (see pp. 15–17). On the Catholic side, Edmund Campion (1540–1581) disguised himself as a jewel merchant to serve as a Jesuit missionary to England during the reign of Queen Elizabeth I (1533–1603). He was eventually betrayed and discovered in a “priest hole” (small cupboards in which English Catholic families hid priests from the authorities). Thrown into the Tower of London, he stayed in a small cell called “Little-ease” and was tortured on the rack. Elizabeth feared all Catholic priests were agents of the pope and of Spain’s King Charles V; Campion responded that he was not “a traitor to conspire the subversion of my country, but … a priest to minister the sacraments, to hear confessions.” Convicted of treason, he was hanged, drawn, and quartered. Not all Reformation-era prisoners were there for religious reasons. Accused of robbery and murder, Jean-Pierre Chambon (d. 1562), chained in irons in Lyon, France, ended up in a cell with Huguenot merchant Peter Bergier. Chambon found Bergier’s constant prayers annoying. But Bergier’s kindness won Chambon over, and he was converted. Both were executed. Some prison stories come to us from Eastern Christianity’s struggle between church and state. Philip II, metropolitan of Moscow (1507–1569), exacted from his ruler Ivan “the Terrible” (1530–1584), a promise to stop secret police, land confiscation, and executions. But Ivan broke the promise. When Philip refused to bless Ivan at Moscow’s Cathedral of the Annunciation, Ivan hauled Philip off to prison where he was tortured, chained, denied food and water, and eventually killed. A century later Avvakum (1620–1682) refused to accept changes meant to bring Russian Orthodoxy closer to the Greek Orthodox form of worship and to centralize the power of the Russian church’s ruling patriarch, Nikon (1605–1681). He suffered brutal reprisals for over 14 years, including imprisonment in a small hut in Siberia, before being executed; during his imprisonment he penned a vivid autobiography, a milestone of modern Russian literature. Recent Christian prisoners have similar stories to tell. Many center on wartime, such as the well-known story of Dietrich Bonhoeffer (1906–1945). Arrested in April 1943 by the Gestapo, he was imprisoned at Tegel, transferred to a Nazi concentration camp, and executed by hanging as the Nazi regime was collapsing. Louis Zamperini (1917–2014), an Olympic track star, joined the Army Air Corps, then crashed over the Pacific. Following 47 days at sea, Zamperini was made a POW by the Japanese and repeatedly abused by a camp sergeant. Years later at the encouragement of his wife and her Christian friends, Zamperini attended a Billy Graham crusade. There he recalled his prayers during his time on the raft and in prison, and recommitted his life to Christ. As he forgave his captors, his nightmares went away. He became an evangelist. Jürgen Moltmann (b. 1926) was drafted into the German army in 1944 as an 18-year-old and was soon taken prisoner by the British. He felt completely forsaken by God until a British army chaplain visited his camp and distributed Bibles. This was the first Bible Moltmann ever owned. He started reading it without much interest but soon stumbled on the psalms of lament and the story of the Passion. When he read Jesus’ death cry, “My God, why have you forsaken me,” he knew that Christ, the suffering God, understood him. 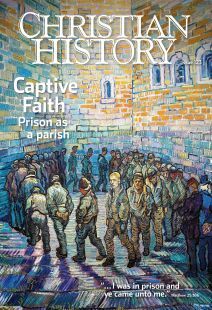 This article is from Christian History magazine #123 Captive Faith. Read it in context here! Roy Stults is retired from the Voice of the Martyrs. Jennifer Woodruff Tait is managing editor of Christian History.